Now this is a category I get uber excited about. I mean, what naturalista doesn't love a great deep conditioner? Deep conditioning is such an essential component of any healthy hair regimen. Depending upon your hair's needs, either an emollient-rich, hydrating deep conditioner or protein-infused masque can be the lifeline that brings tired, weary, dry, dull tresses back from the brink. 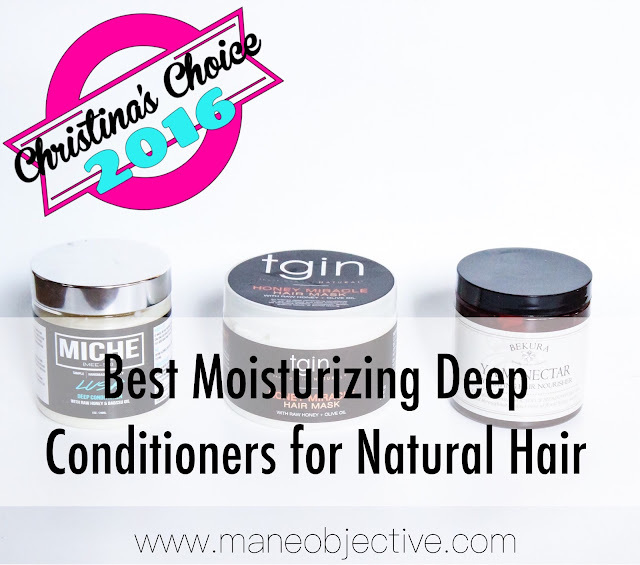 And for that very reason, I've decided that for Christina's Choice 2016 I'm splitting the deep conditioners into two categories - moisturizing and strengthening. That way, my protein-sensitive naturalistas have a few options, as well as those who (like me), love ALL the proteins. Without further delay, let's get this party started! LUSH is the brainchild of beauty YouTuber Michelle B.//Everything Mich and burst onto the natural haircare scene in a real way. It's thick, rich, full of mega moisturizers like aloe, castor oil, babassu oil, and honey - while maintaining an intense amount of slip that will make any naturalista happy to have wash day. The fragrance is a dream, and it makes my curls feel smoooooth as buttah. LUSH Deep Conditioner is a knockout offering from Michelle, and I love the idea of supporting a content creator branching off into full-blown entrepreneurship. I don't think Honey Miracle Hair Mask will not never be on this list. It's one deep conditioner that I've seen naturalistas of all textures and types flock to - not only does it smell amazing and feel super creamy, it's loaded with honey, olive, and jojoba oils - providing a decadently moisturizing punch while making the hair feel super smooth and shiny. And the slip? Off the chain. I can't get enough of Honey Miracle Hair Mask - I've been rocking with it since my transitioning days...which is a crazy feat for a product junkie like me! You ever have one of those products that you've had your eye on for a loooooong time, but never pulled the trigger? YAM Nectar was that product for me. I heard the stories and legends surrounding this product, but didn't dive in until this year. But when I did? LOVE. Love at first scoop. YAM Nectar isn't your typical moisturizing deep conditioner. It looks like honey, moves like sticky candy, but goes on the hair easily with sooooo much slip. The softness and shine that YAM Nectar delivers is out of this world. It's truly an experience - and one of the best that my curls had in 2016. Since my transitioning days in 2012, my hair has been through a lot. From heat damage, to healthy, to color damage, recovery, and the road back - Honey Miracle Hair Mask has seen it all. And performed beautifully in each scenario. That alone makes it worth the coveted Deserted Island Pick. But the fact that I can easily access tgin on the ground at Target and Sally Beauty makes it that much easier to love. No matter what condition your hair is currently in - Honey Miracle Hair Mask will work it out for sure! 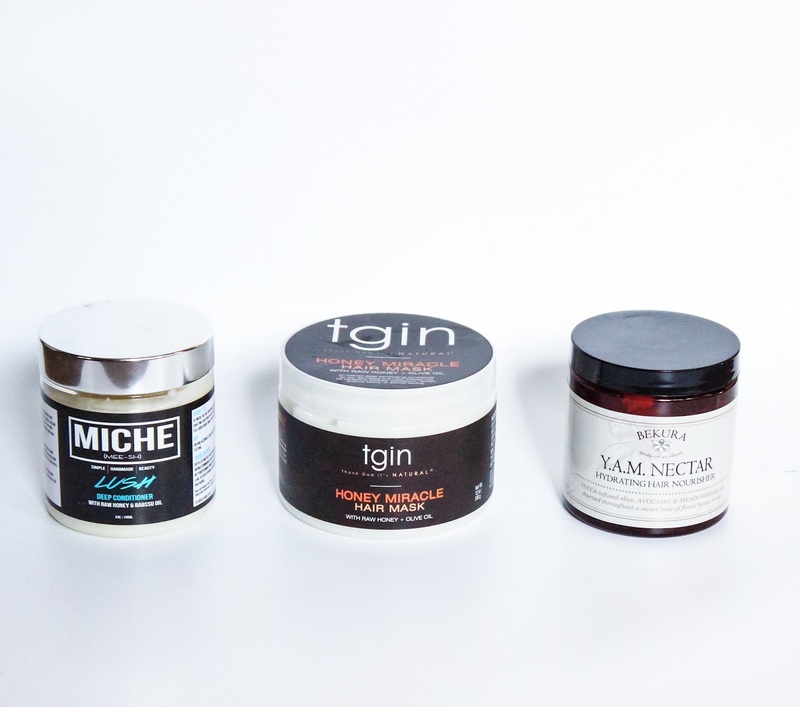 These deep conditioners will leave your hair strong...and soft. Just in case you thought about sleeping on Inahsi Naturals Mango Hemp Restorative Hair Masque, let me tell you why you shouldn't. Mango, hemp, avocado, silk aminos, and oat protein make this strengthening masque one for the books! Not only is it super thick and moisturizing, it nourishes the hair while strengthening the weakest spots along the strand. My curls felt amazing after one use - so I kept coming back, and back, and back. I couldn't get enough. Still can't. Whether I use it for 5 minutes in the shower or 30 minutes with heat, the results are epic - smooth, shiny, soft, strong hair - every single time. I'll be posting a review on this soon, for sure. P.S. - Mango Hemp Restorative Hair Masque is on sale for $9.99 right now! Getchu some! Listen. In 2015, Afrotastic Curl Elastic had me getting every inch of my life. In 2016, no exceptions are being made. Once Soultanicals had me regrouped from my LifeAlert bracelet moment (when they entered Target stores and fulfilled my lifelong natural dreams), you couldn't keep me off the hair aisle. Afrotastic Curl Elastic is always in rotation - it's a nutritional powerhouse for hair that needs a little extra TLC. The water is botanically infused with marshmallow, rosemary, burdock root, amla, sage, and more to strengthen hair at the roots and stimulate growth. Pro Vitamin B5 and hydrolyzed jojoba protein strengthen and fortify the hair, while ximenia, olive, and avocado deeply moisturize and smooth rough cuticles. P.S. Soultanicals is having their 50% off end of the year sale right now, (use code YEAREND50) plus salon sizes are $25! You can't beat that with a stick! Listen, Linda. In my original Mielle Organics review video, I was mad, shocked, and hurt that nobody told me how bomb the Babassu Oil Mint Deep Conditioner was. And then, I was in LifeAlert mode again when Mielle Organics showed up in Sally's. Y'all. I was literally calling various locations, driving around, calendaring the inventory delivery dates - in the name of getting my hands on this stuff. I literally would buy 2, 3, or 4 at a time - because I didn't ever want to be without it. And I still don't. The Unique blend of babassu oil and amino acids make this deep conditioner one for the ages - it strengthens and enhances natural texture without the direct use of hydrolyzed proteins - making it a great option for protein sensitive naturalistas. New on the scene (for me at least), and pulling no punches is Curls Dynasty. I went into a pumpkin frenzy in 2016, after learning the DHT-blocking benefits of pumpkin. Curls Dynasty is one of the few brands to uniquely harness this nutrient powerhouse, using pumpkin seed oil and extract along with peppermint, yucca, horsetail, and nettle to strengthen and fortify hair from the roots on down. Even though it does contain protein (which I love), the Pumpkin Mint Deep Treatment Masque leaves the hair soft, smooth, strong, and supple while providing a tingly mint sensation on the scalp. It blew me away at first use, and I was instantly addicted. I kept going back. And back again. And back again. Who was shocked by this one? Let me know in the comments below! But in the end, I had to choose. 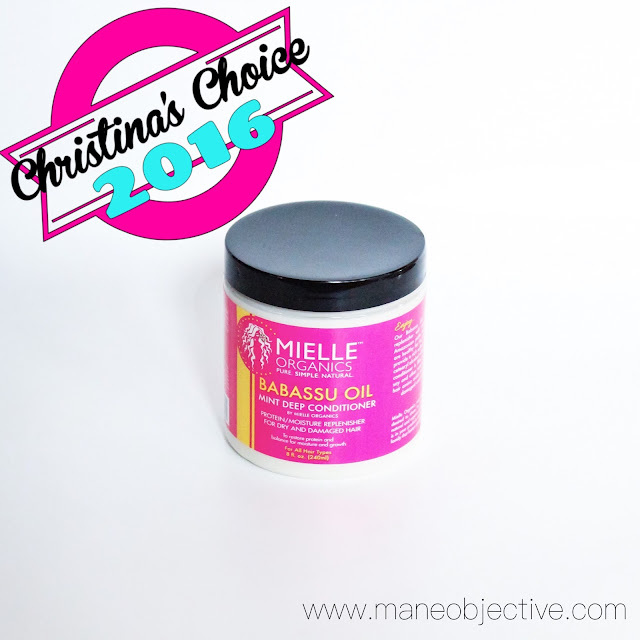 I couldn't violate the spirit of the Deserted Island Pick...so by the narrowest of margins, I present the winner - Mielle Organics Babassu Oil Mint Deep Conditioner. 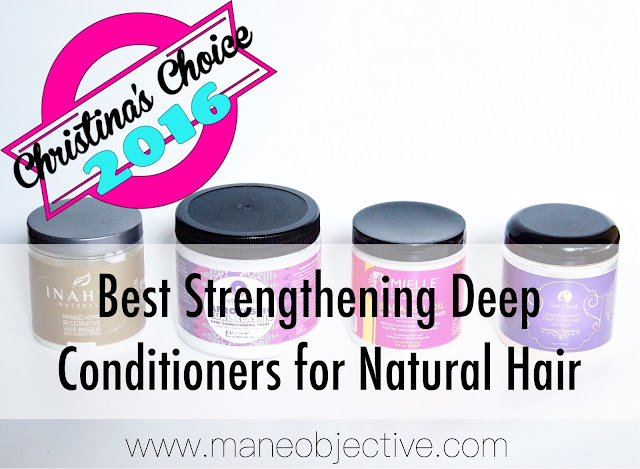 What deep conditioners are winning with you as we go into 2017? Any on this list you're anxious to try?Let me know in the comments below! Stay tuned - best leave-in conditioners are next! Your Monica Remix had me weak!! I plan to try Mielle very soon!! LOL! I'm a hot mess. And I hope you do - you'll definitely enjoy it! Seems like I need to get my hand on some Mielle at some point. I loved the Soultanicals Afrotastic Curl Elastic. Looking forward to the leave ins. YES YES YES you do!!! And Afrotastic is the JAM! Those are up next!!! I'm really looking forward to it. Would you still use the EVA NYC Hair Therapy Session mask when straightening your hair? They look good. Are they so great for a hair? My is quite damaged because I love to dye it in some bright colors like pink or velvet. Ant such colors demand the hair to be dyed to the white,s o it's not so good for the hair, actually. I think I'd buy those mask and write a review at the http://english-educator.com/ after using them.